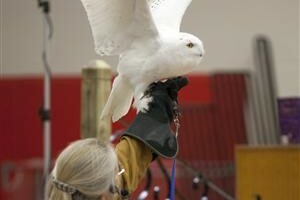 Each year, the Harwich Conservation Trust hosts “Eyes on Owls” led by naturalist educators Marcia and Mark Wilson who tour the Northeast, offering audiences up-close looks at these secretive raptors. The event is sponsored by the Birdwatcher’s General Store, Cape Cod Five Cents Savings Bank, Cape Cod Chronicle, Cape Codder, Harwich Oracle, The Register, and The Cape Cod Times. Each owl has a permanent disability, which prevents release into the wild. The Wilsons are permitted by state and federal agencies to tour with the owls. Mark, a retired professional photographer with The Boston Globe, leads an introductory slide show. The duo then walk around with the owls tethered to their gloved hands to highlight the raptors’ habits and biology. 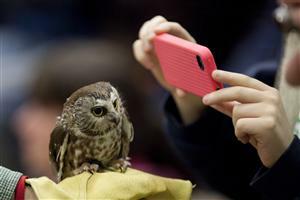 Volunteers from the audience even get a chance to hoot alongside the owls. 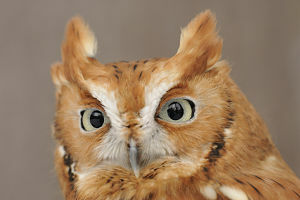 The Wilsons bring owls that are found locally including great-horned owl with golden irises, red morph screech owl and the soda can-sized saw-whet owl. They also showcase owls from around the globe, including the Eurasian eagle owl (largest owl species in the world) and the South American spectacled owl. The barred owl with its dark charcoal-colored eyes and the striking snowy owl will also make an appearance. Most folks rarely hear owls, much less see them, so this is a rare opportunity to do both up close. Prices are $5.00 each for ages 5 to 11 and $10.00 each for ages 12 to adult. The program is not recommended for ages under 5. Programs are at the Harwich Community Center, 100 Oak Street in Harwich Center. Proceeds help the Harwich Conservation Trust save wildlife habitat. 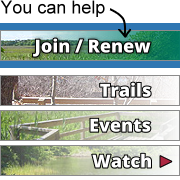 Sign up below to receive our free e-news with announcements about future events.